The Anapest fits snuggly as a trisyllabic metrical foot made up of three syllables obviously. 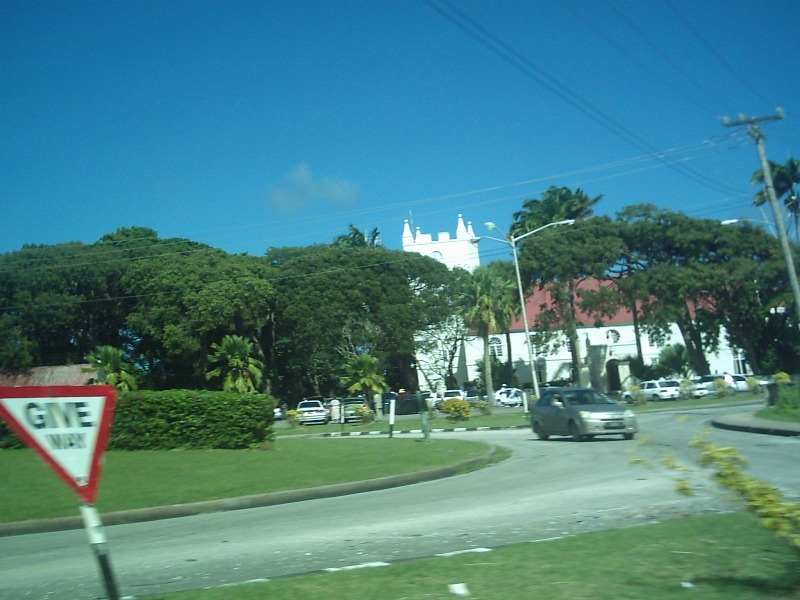 The British spelling for it is Anapaest and the American spelling is Anapest. 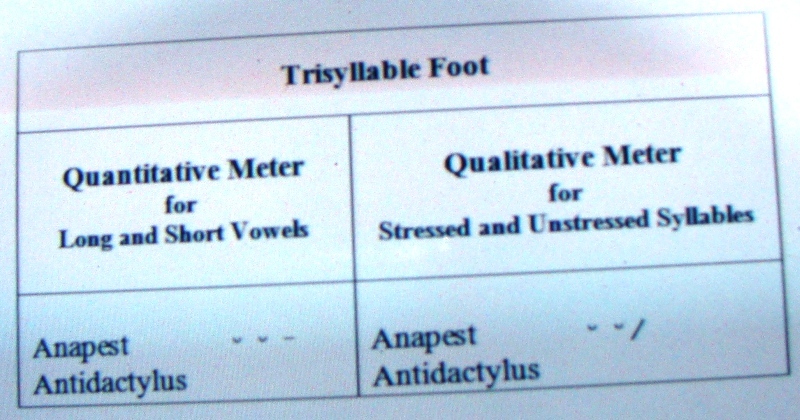 This anapestic foot is shown in the Table above and is made up of two short syllables followed by one long syllable in quantitative meter; and in accentual-syllabic meter used in English language poetry two unstressed syllables followed by one stressed syllable . By the way “meter” is American spelling and the British spelling is “metre”. The Anapest is also known as the Antidactylus because the dactyl ( ̷ ᵕ ᵕ ) has this symbolic pattern in reversed order. English language poetry tends to use the Anapest as the dominant foot in the writing of Limericks. 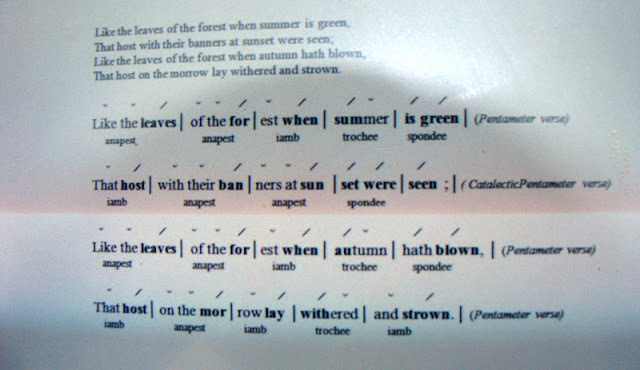 In accentual-syllabic meter the Anapest because it ends with a stressed syllable easily facilitates strong end-rhymes and tends to create a very rolling, galloping feeling verse, and allows for long verses with a great deal of internal complexity. 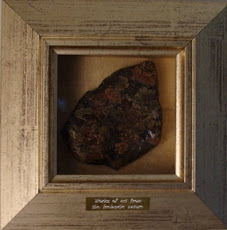 The poem used as an example is “The Destruction of Sennacherib” by the poet Lord George Gordon Bryon published in 1815. This poem describes the events that are chronicled in 2 Kings 18-19 of the Bible. 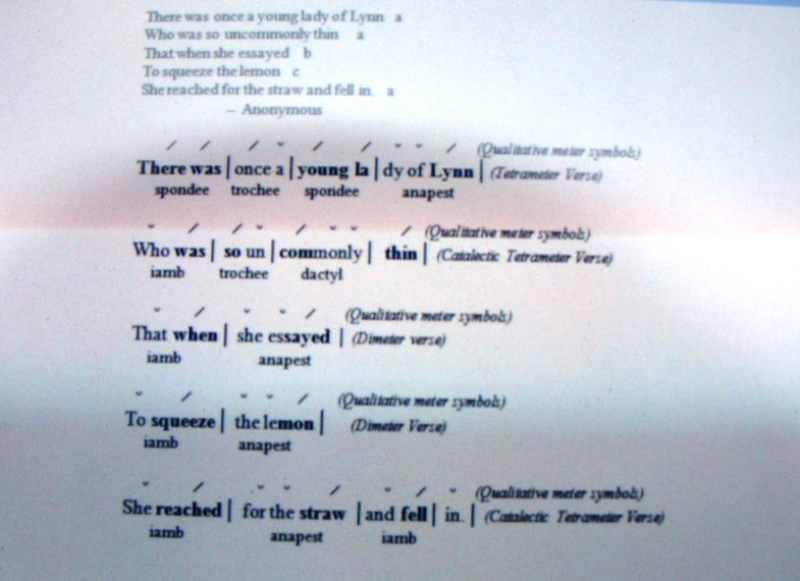 The stanzas from Bryon’s poem are scanned to show the effects of the anapest in Qualitative meter giving rise to Pentameter verses. Take a look. 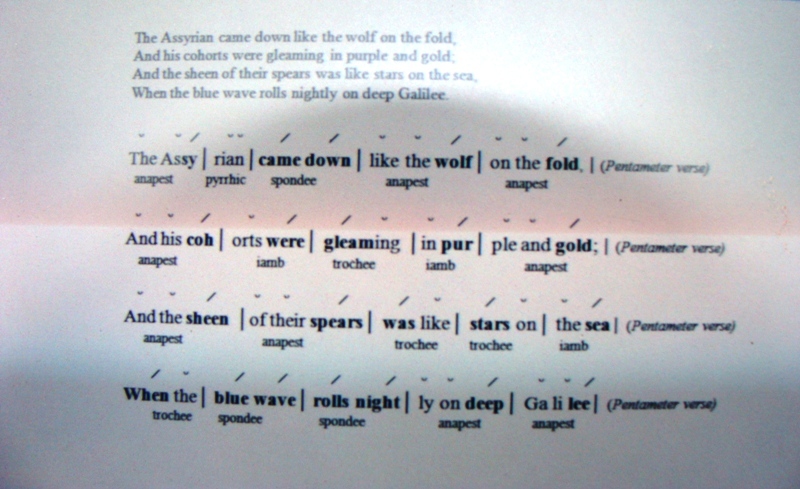 But some Anapestic Limericks have this rhyme scheme aabca, shown below. 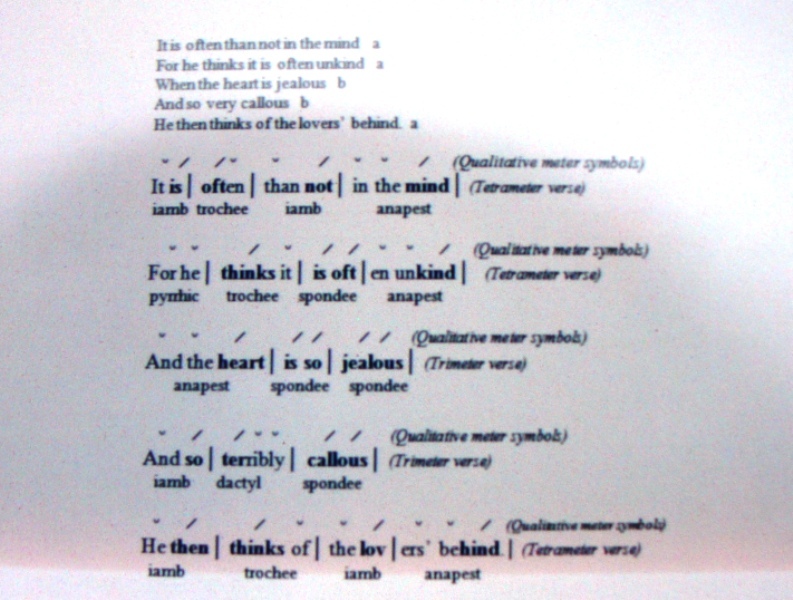 The poet Lewis Carroll is famous for his masterful use of the Anapest in Tetrameter verses rhyming abab. Here is an example of a stanza taken from his poem, “The Hunting of the Snark”. 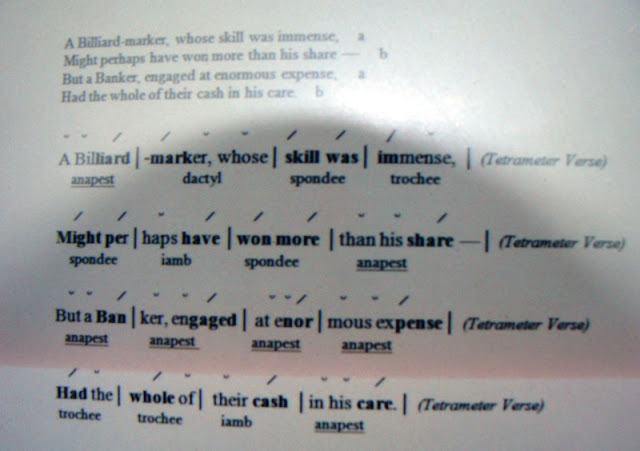 In the example the anapest is underlined for quick recognition.